Sony has been a household name from about the beginning of all modern electronics. So when it comes to Ultrabooks it just seems natural that Sony would be in on making the lightest laptop on the market. 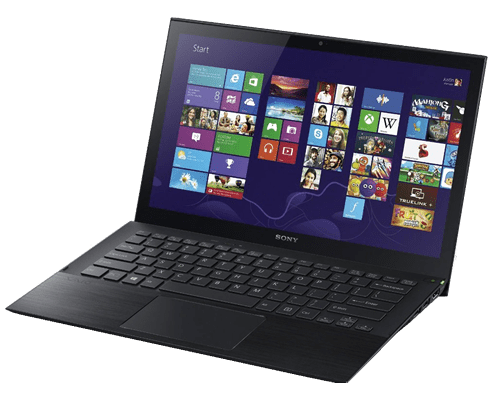 Sony has released the VAIO Pro 13.3-inch Core i7 Touchscreen Ultrabook that weighs in at a mere 2.34 pounds and it’s only 0.68-inches at its thickest point. The VAIO Pro 13 was designed and engineered by the experts of Sony and the certainly paid attention to all the details. This Ultrabook’s chassis and body are made entirely of carbon fiber, a very strong, yet lightweight, material that’s found in military grade gear, Formula One race cars and airplanes. The carbon fiber keeps it light but also helps to keep it safe with its amazing durability. As you look over the entire body of the laptop you won’t find any product stickers anywhere on it; from the top to the bottom it’s a sleek looking professional piece of equipment. Both the top and underside of the laptop has the signature AVIO logo engraved into the carbon fiber body. Looking good from top to bottom seems to have been a major consideration in the design phase. Sony uses the carbon fiber body to keep the Intel Core i7-4500U, 1.80GHz (with the Intel Turbo Boost Technology you can get up to 3.00GHz), 8GB DDR3 with 256GB Solid State Drive safe and sound. However, just because Sony seemed to have honed in on the style and grace of the looks of this Ultrabook, they definitely did not cut and corners when it came user comfort. The brushed aluminum palm rest is extremely ergonomic and comfortable enough for the all-day typer. 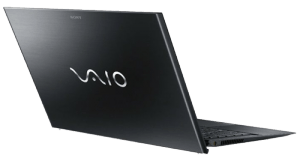 The VAIO’s 13.3-inch Full HD 1920 x 1080p touchscreen LCD with TRILUMINOS Display is just what the vision doctor ordered. The display on this touchscreen is natural, crisp and sharp and has a larger color gamut than many of its competitors. Even viewing this display from extreme side angles that typically aren’t the best for viewing, is absolutely no problem for the Sony AVIO Pro 13. Sony packs this beauty with new generation technology that makes colors more pure and distinct with a much wider color range. It also performs all of the Windows 8 10-point touchscreen features. High speed SSDs are always sought after. The VAIO Pro 13 includes a high speed PCIe SSD drive on of their models. The PCIe technology facilitates the superior performance and allows for it to be much faster than a traditional laptop. When we say everything is faster, we really mean everything. 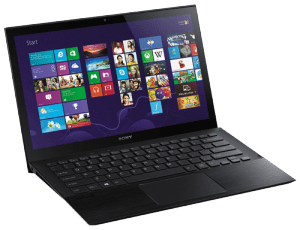 The boot-up is faster, launching applications to open is faster, and the overall performance of the Sony AVIO is enhanced. Due to the non-moving parts of the SSD there are less chances of damages while in transit. Speaking of being in transit, let’s touch on some of the features for all-day mobility. The battery life has been extended and lasts up to 6.5 hours under normal web browsing and document editing with the screen set on mid-range to high brightness. You’ll enjoy doubled battery life thanks to the optional large-capacity battery. The battery, however, is non-removable, so you will have to carry a charger with you when you’re out and about and not just an extra battery. Also with Sony’s original Rapid Wake technology you won’t ever have to turn off and shut-down your laptop again. With their technology all you have to do is close the lid when you’re done with your daily activities and it will immediately shift your computer into sleep mode. To turn it back on, simply lift the screen and everything will resume within seconds, and when you’re not plugged in, you can just close the lid and it will automatically conserve your battery while in sleep mode. We really liked how fast the system rebooted back up after only a couple of seconds. Lastly, we will touch on the keyboard. The keyboard is full size and is backlit for nighttime operations. Designed for precision, the keys have a very nice travel depth of about 2.2mm and they are very responsive and bounce back nice and tight giving the keyboard a real professional feel and of course providing ultimate comfort. And let’s not forget the trackpad, it is extremely accurate and very responsive to every multi-finger gesture available. Coming in at a price range of about $999.99 USD it stands up there with other flagship computers like the MacBook Pro and Lenovo’s line of high-end flagship computers. But if you’re looking for reliability, portability and a professional look and performance, you often get what you pay for, and since you’ll be paying a lot, you should expect, and will receive a lot with the Sony AVIO Pro 13. 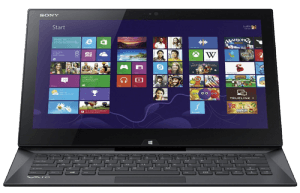 Planing on buying the new Sony VAIO laptop? 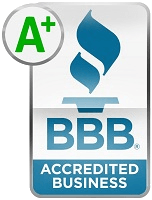 We can help you sell your laptop, tablet, or smartphone. Even broken one! Check our home page for more details.